Joe Dimaggio played his entire 13-year baseball career for the New York Yankees. He was voted into the Baseball Hall of Fame in 1955. Mantle played his storied 18-year major-league professional career all for the New York Yankees, winning 3 American League MVP titles and playing in 16 All-Star games. This is a Joe DiMaggio and Mickey Mantle custom premium framed unautographed Signature Engraved oversize 33x32 piece. 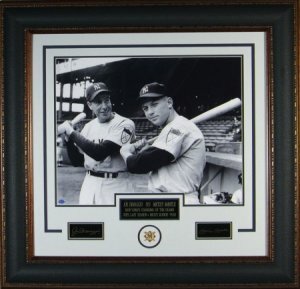 FEATURING THE ENGRAVED REPLICA SIGNATURES OF Hall of famers Joe DiMaggio and Mickey Mantle. This product was added to our catalog on Thursday 21 December, 2006.